Geoff Thornley turned away from pure painting in order to better understand its fundamental elements — surface, edge and plane, and the relationship of painting to the wall. The result of this shift, which occupied the artist for nearly a decade, was a series of painted constructions. Built from pieces of canvas-covered board that were then painted and assembled, the constructions underwent numerous permutations over the following decade, among them a series of tondos, or circular works. Construction #11 — Tondo is the largest of these, and the one that Thornley rightly regards as the finest. 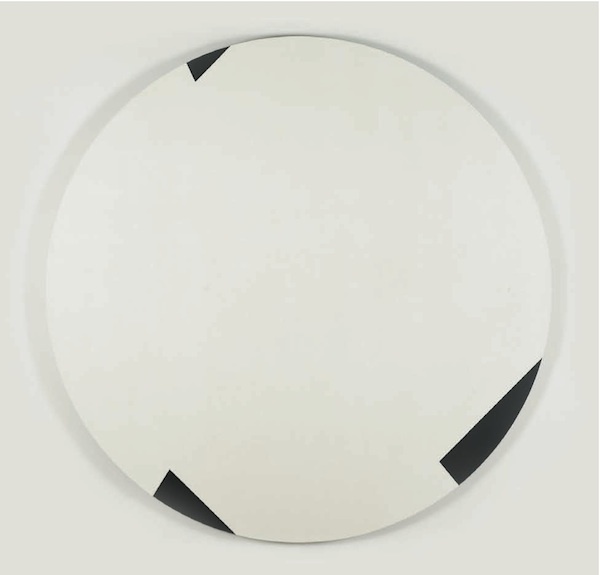 At this scale, nearly two metres in diameter, Construction #11 — Tondo is an expansive work, commanding the space it occupies and physically engaging the viewer in the activity of seeing. Sight, however, plays tricks. What appears to be a single, unified surface is in fact composed of two separate layers. The dark layer sits beneath the light one, and the three triangular shapes at the work’s edge are actually cut out of the top layer. Thornley placed these cuts intuitively, and their shape and size do not follow any particular mathematical formula. They point to the work’s notional centre while at the same time directing the eye to its edge, where they set the work on its centrifugal spin. These contrasting forces — inward and outward momentum, stillness and dynamism — are delicately held in tension. This delicacy is matched by the painted surface of the work. What appears to be black and white is in fact the product of the artist’s abiding interest in colour: the black has tinges of charcoal and blue adding to its rich depth, while the white is inflected with Naples yellow to produce a creamy warmth. The paint is applied with regular strokes, built up from thin layers over a canvas that has been painstakingly prepared to produce a finely porous surface. Construction #11 — Tondo rewards hard looking, but it is also a work upon which the eye, if weary from those demands, can find rest. This essay first appeared in Art at Te Papa (Te Papa Press, Wellington, 2009). Reproduced with permission of Te Papa Press.